07.12.12 As a working mom, you've got a lot to do. Maybe it's time to take a break? One of the tenets of being a working mom is being busy. I know I am. I’ve got deadlines at work and wipes to pick up at Target and I really want to watch the next episode of Parenthood on Netflix, but first, I better set out my workout clothes for tomorrow morning so I’m not stumbling around half awake at 6 a.m. looking for socks, and that reminds me, my son needs an extra set of clothes for his preschool cubby so I should put those in his backpack by the door so I don’t forget them in morning rush, oh, and I really need to get that load of laundry done. Whew. See what I mean? Busy. But while being busy can certainly make you feel accomplished, it’s got its drawbacks too, as this widely-read opinion piece on the nytimes.com pointed out. I wholeheartedly agree, which is why I often put myself on self-imposed toddler time. Being on toddler time means that I do what my son wants to do for as long as he wants to do it, sans distractions—be it the to-do list in my head or my unanswered emails. Granted, this doesn’t work when you need to get to preschool on time or when the requests for “one more book” at bedtime have reached the 20-minute mark, but it’s a given on weekends and holidays. Case in point, last week we met my family at a local beach for July 4. 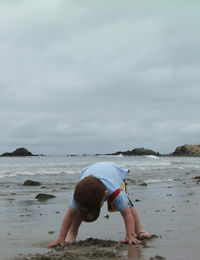 My son was immediately taken with the ocean and spent the next five hours doing, well, not much of anything, really. He dug in the sand. He walked to the edge of the water with his grandmother and ran away from the surf as it came in. He collected rocks in a bucket. About two hours in, I tried to get him to take a walk down the beach, but he got distracted by covering his feet with sand, then pulling one foot out and then the other, and then covering them up again, so I gave up on the walk and watched him cover his feet. We did eventually make it down the beach and discovered a whole world of hermit crabs at low tide, and my son spent a good half hour just looking at them. I will admit that it’s hard to be on toddler time. It takes immense willpower to push my to-do list to the back burner, incredible amounts of patience and, sometimes, Oscar-worthy acting to pretend that hermit crabs are fascinating for more than five minutes. But, there’s something to be said for taking a break from being so busy—and just being. Even a toddler knows that. How do you bust the business of being a working mom?